1) Make up Monday’s squatting if you missed it. 40 sec max cals; rest 4 min while team members go. 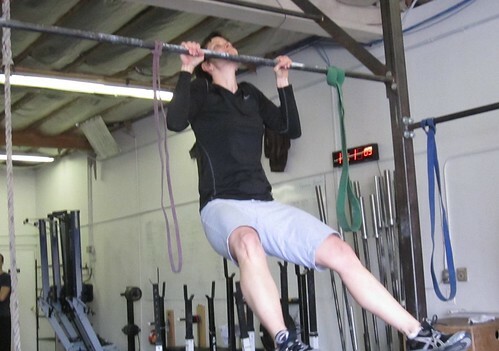 Heather G., congrats on the strict pull up and making it look so easy! This is Heather’s last week in Portland and we will certainly miss you and the family!!! We are on week 2 of the Wendler 5-3-1. We have undertaken a new strength phase here at CrossFit Portland over the next few months. We are going to use the Wendler 5-3-1 program to build basic strength. Retired powerlifter Jim Wendler developed this training system. Though the exact schedule may change some, for now we are going to be squatting on Mondays, pressing on Wednesdays, and deadlifting on Fridays. If you miss those days, the following day becomes your make-up day. This may require shortening that day’s workout a bit to get the strength work done. The program involves doing three sets of each movement, each one at a progressively heavier load. The last set is as many reps as possible. Where many of the strength focus programs we’ve done before look primarily at increasing your one rep maxes, this program increases the loads at which you can perform multiple repetitions. (your one rep max will increase, also) This carries over well to fitness and performance in many areas. Each cycle is four weeks long, with the fourth week being a de-load or back off week. Starting the next cycle, you’d add a max of 5 lbs to your press max and 5-10 lbs to your squat and deadlift max to do the calculations from and then repeat the process. Go up slow and enjoy the ride! The two primary limiting factors for most trainees are lack of basic strength and lack of functional mobility. We will be looking to improve these two areas over the next few months. You will find that endurance and work capacity can be developed much more quickly once a base of both strength and pain-free movement has been established.